There have been quite a few amazing NCTE reflection posts around the internet, and we here at chartchums would be remiss if we did not add ours in to the mix. There were so many things that made the NCTE convention special, not the least of which was the incredible community of educators we were among. So much of our profession is about giving. We give time―to planning, to parents, to meetings, to a special lunch date with a kiddo. We give energy―to our students, to our schools, to our runs up and down flights of stairs. We give our hearts―to everyone. There comes a time when you can feel all given out―when you look around and think, “That’s it, I’ve got nothing left.” For Kristi, that was the week before NCTE. She was fighting a cold while trying to meet data deadlines, finishing up long nights of parent teacher conferences, and finalizing overdue writing projects. Kristi felt she had reached a point of tapping out. Going to a conference on literacy seemed about as desirable as sticking hot knives in her eyes. Yet, she went. As did so many of you―just as tired, just as empty-feeling. But here is the thing―every second of NCTE, whether listening to amazing and powerful presentations from people like Kathy Collins and Matt Glover, browsing the booths to see the latest and greatest books, meeting people you fell in love with over twitter (Hi Shawna!!! ), falling in love with new people (Hi Katie and Sara!!!! ), or seeing friends that fill you with hope and joy (Hi Kristin!!! ), NCTE is about filling ourselves up. Filling ourselves up with knowledge, filling ourselves with hope, filling ourselves with joy and energy. And it is important that we take time to fill ourselves back up, so we can give everything back once again. Since all of you were not able to attend the conference, we are giving you a summary of our workshop, so you can virtually experience the benefits of NCTE, but as far as the laser light show and ice slide, that you will have to imagine! We (Kristi and Marjorie) were lucky to present with a brilliant writer, editor and friend, Zoe Ryder White. Zoe brought the critical (and sometimes overlooked) parent perspective to our work with charts, and shared how charts can empower children at home, as well as school. Our presentation focused on the “meta” aspects of charting, specifically that charting is a way to teach types of thinking and that charts underscore a growth mindset. Some questions we asked our audience, which we ask you also, is: What is the thinking that you demonstrate in your charts? Do you tend to show just one way? Or do you have a varied menu of ways of thinking that you are (implicitly or explicitly) teaching children? We also spoke a bit about how (smarter) charts are automatically oriented towards a growth mindset. 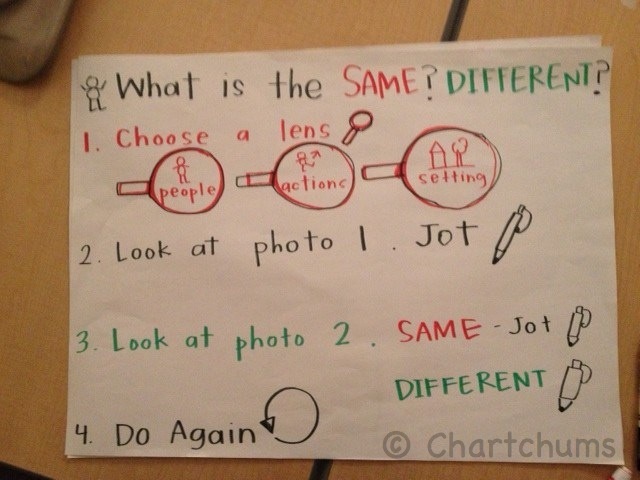 By making and using charts with children, you are showing a path in which to grow. By encouraging goal setting and flexibility, you are helping children realize a positive association between effort and outcome. We hope this helps you in your charting journey and look forward to hearing from you as to the ways you are using charts to help your children think flexibly and independently. Kristi and Marjorie, and Zoe, too! Requires development of plans for attaining the desired goals. What works is making a vivid, concrete plan: “Tomorrow during my break, I’ll get a cup of tea, close the door to my office, and call the graduate school.” Or in another case: “On Wednesday morning, right after I get up and brush my teeth, I’ll sit at my desk and start writing my report.” … Think of something you need to do, something you want to learn, or a problem you have to confront. What is it? Now make a concrete plan. When will you follow through on your plan? Where will you do it? How will you do it? Think about it in vivid detail….These concrete plans – plans you can visualize – about when, where, and how you are going to do something lead to really high levels of follow through, which, of course, ups the chance of success (Dweck, p. 228). This, dear friends, is where charts come in! Co-creating a personalized or class chart helps children visualize the attainment of whatever goal they have, which in turn will lead to increased follow through and success. We write down recipes and directions for a reason. It is not enough to know you want to make lasagna, you need the steps to be successful. Once your formative assessments have helped you and your students identify areas of need, charts help everyone get there, they provide the steps. We refer to these particular charts as process charts, and have more about them in our upcoming book, Smarter Charts for Math, Science and Social Studies. 1. Use your goal (or destination) as your heading. This keeps the focus on the big idea, not the ticky tacky bits that make it up. 2. Use numbers or arrows when appropriate, these small reminders help children be organized in their thinking and their work. 3. Co-construct the chart so that the children visualize alongside you, using their language as much as possible to make the chart meaningful and personal. 4. Use visuals that break down the steps quickly and easily. Kristi found that this student had a host of snap words he knew by heart in isolation, but when it came time to reading books, all that knowledge flew out the window. His running records showed many miscues for words that he knew on sight. Usage of these words as he read would help his comprehension and his accuracy. 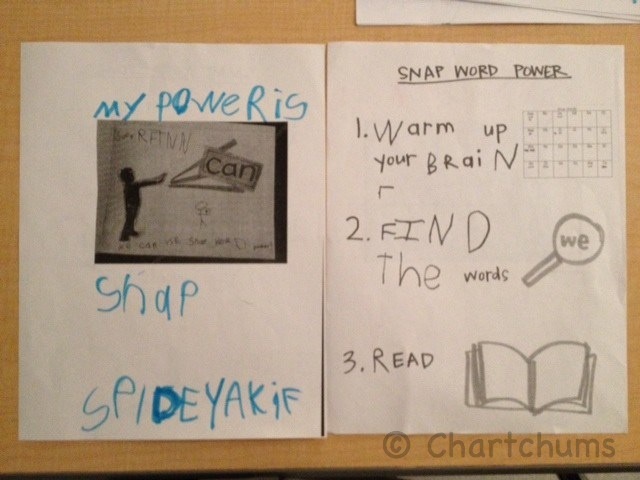 As an English Language Learner, this child was at a disadvantage in relying on his syntax, but sight words could be a strength for him to depend on. Kristi sat with this child to explain the conundrum, ending with the reason why snap words matter to readers. It helps us understand and read the book, saving our brain energy for the tricky words. The child and Kristi co-constructed a plan: first warm up to remember all the words he knows, then take a book walk to see if he could find any of those words in the book he wanted to read, then read the book. The how: Warm-up and then go! Marjorie asked a group of students to compare and contrast two photos of classrooms from long ago and today and found that many children struggled. Some did not know what to write, some just wrote about one photo, some described what they thought was happening. Marjorie designed lessons around the lenses children could use to look at photos, emphasizing that when you look between two items, you always want to ask yourself: what is the same? what is different? The when: Whenever you have two things in front of you, it is a worthy endeavor to figure out out how they are the same and how they are different. The where: In social studies, science, reading, writing, math – any of these times could work for comparing two things. The how: Go slowly and systematically, when you try to see everything you see nothing. Choose one lens at a time and repeat the plan as needed. Just One More Reason To Love Charts! Charts are not just descriptive: here is how we did something, they can also be prescriptive: here is how to do something. In a classroom you may have charts that represent both ideas, but the important thing is that you have charts. Charts serve as a way to grow independence, but also as models of ways to achieve success. A thoughtful recording of the where, when, and how is a skill that will help children (and teachers!) for a lifetime. Share your thoughts in the comments below! Happy Charting!